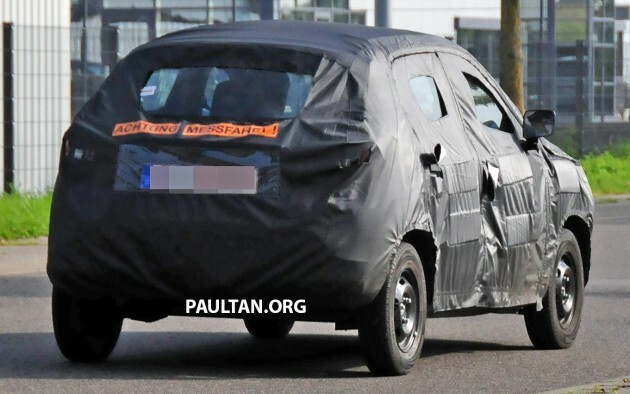 SPYSHOTS: 2015 Renault Kayou - a cut-price Dacia? 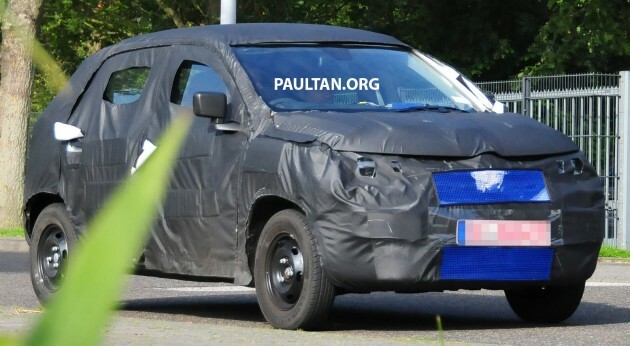 Home » Cars » Dacia » SPYSHOTS: 2015 Renault Kayou – a cut-price Dacia? SPYSHOTS: 2015 Renault Kayou – a cut-price Dacia? Spotted earlier in India as a prototype, additional shots of the 2015 Renault Kayou (codenamed Renault XBA) have surfaced again – this time showing a mule on the roads of Europe. The entry-level hatch was conceived as a competitor to the Maruti Suzuki Alto in India, which is slated to be launched in the country on May 20. Based on the Renault-Nissan CMF-A platform, the budget hatch will most likely arrive in Europe with a Dacia badge and will sit a rung lower than the Sandero – making it the new entry-level model in the marque’s range. Don’t expect it to arrive anytime soon, though. Reports are indicating that should such a thing happen in the first place, the European Kayou will arrive a year later after its Indian sibling premieres. Underneath its tiny bonnet, the Indian-market 2015 Renault Kayou will come powered by a 0.8 litre three-cylinder petrol engine pumping out somewhere between 45 to 50 hp. Transmission options are expected to include a five-speed manual and an automated manual gearbox. The Kayou will be assembled Renault-Nissan’s Chennai plant and is expected to cost between 300,000 to 400,000 rupee (RM16,852 to RM22,470). Word on the vine is that the European version, again pending confirmation, will be built in Morocco. Should that be the case, expect it to cost roughly €5,000 (RM20,385). Then we have that Aston Martin Lagonda Taraf and that Maserati Kubang though it was just a concept in 2003. Don’t forget the Bentley Bentayga, and the still very amusing Toyota SAI…. Kayou? tak senonoh betul nama.. The price will become “emas” IF it comes to Malaysia. P1 or P2 sure “tutup kedai” and DrM will cry why the company humiliating him.